Dowco’s irrigation startup service includes everything you need to get your system up & running for the season as well as be compliant with St. Louis County's backflow regulations. Early in the spring is the best time to startup your sprinkler system and check it out. Even though we tend to get a lot of rain in the spring, you should be proactive and get your system started and running as soon as possible. This allows time for repairs to be made to the system or backflow, if needed. Be proactive and catch those repairs early and not in the middle of the summer when we are going through another heat wave & drought. The best thing you can do for your lawn, in addition to our fertilization program, is to feed it with lots of water! And those spring plantings & flowers need to be watered in to allow those new roots to grow and anchor. After your irrigation startup, you do not have to run the system all the time. Dowco can install a rain gauge to shut your system down when there is water detected in the ground so you don’t see your system running and wasting water during those spring storms that we see so often in St. Louis. Turn on the main water line in the basement and check for any leaks leading outside to the backflow device. Inspect the backflow device for any leaks or damage that may have occurred over the winter months. If the backflow device passes, we will forward the results to the county for their records. If the backflow device fails, we will follow up with an estimate to bring the device up to code and retest after the repairs have been made. Replace all batteries in your system including the timer or battery powered valves. Run through entire system and check for leaks and non-functioning heads or valves. We will recommend and make repairs. Check coverage on all heads and make adjustments as needed for optimum coverage. You will need to be home in order for the technician to get to the main water line (usually in the basement) and the control timer (usually in the garage). We also encourage you to walk the system with the technician to discuss needed repairs and ways to optimize the system and the coverage provided for the lawn and plants. The backflow test will be completed within 10 days of the test. You will not need to be home. We will send the results of the test to St. Louis County for you. You'll know the test was completed by checking the backflow device for a new Dowco tag with the current date of test on it. 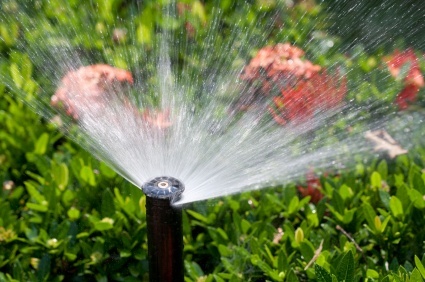 Your irrigation system should be started up between March-May. Schedule online today!